Using different specialist materials such as silver plated components, and coloured or detectable filaments within our standard ranges of brush we are able to produce bespoke solutions suitable for use within many stages of food processing to meet strict FDA requirements. Widdops Brush currently supply a variety of brushes for use in food hygiene and food processing which are suitable for use in FDA-controlled environments, also including the pharmaceutical industry. 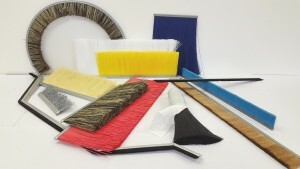 The construction of the brushes and variety of filaments offered can create an environment hostile to a broad spectrum of bacteria, mold and fungi. Silver for example, when used to plate the brush holding strip offers extra protection against bacteria. As silver inhibits the growth of damaging microbes, this greatly reduces cross contamination and eliminates odours and potential health hazards caused by bacteria. Along with the use of antimicrobial filament materials, anti-bacterial brushes can be formed into various custom shapes to meet your specific needs. Where necessary, materials can also be used that are resistant to cleaning chemicals and moisture absorption, this in turn inhibits bacterial growth and prolongs the lifespan of the brush itself. Depending on the desired use within the food hygiene industry please check our ranges of hand-stitched, punched-in, strip and roller brushes or even feel free to contact us for a more bespoke design solution.